Hackney based Turkish Light Heavyweight prospect, Onder ‘Little Mike’ Ozgul is set to face Scunthorpe’s Matthew Pepper, on the Dave Murphy Acourtier events promoted CAPITAL PUNISHMENT, which takes place at the York Hall in Bethnal green, London on Saturday 25th October 2014. 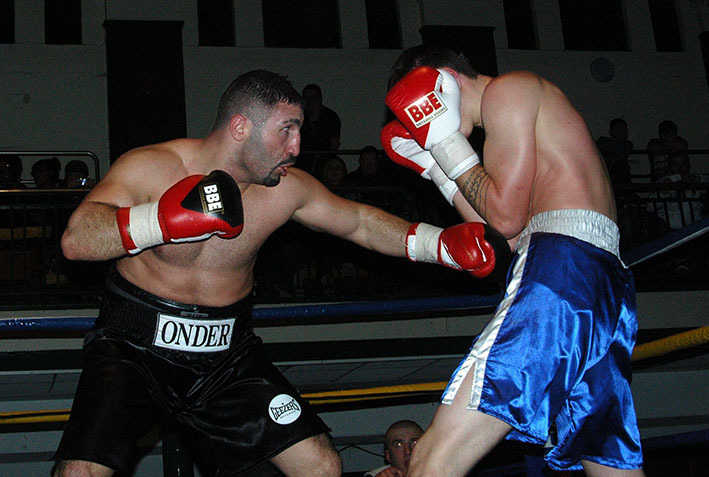 A former Amateur and IABA World Series Of Boxing star Onder has made quite an impact since turning pro in March this year. On his pro debut, Onder scored a shut out points victory over Lithuania’s Dmitrij Kalinovskij, he then followed this up just six weeks later with a first round stoppage win over Brighton’s Iain Jackson, who he had sent to the canvas twice before the fight was stopped mid way through the final minute of round by referee Ian John-Lewis. These wins wouldn’t come as a surprise to his many fans back in his homeland – as it was they who gave him the nickname ‘Little Mike’, due to his style being so similar to that of legendary ‘Iron’ Mike Tyson. His opponent on the 25th October, Matthew Pepper, may be more experienced, having fought ten times previously, but that doesn’t seem to bother Onder one iota, as he made clear when he spoke following a training session with his coach, former Commonwealth Lightweight Champion Mo Hussein at the TRAD TKO Gym in Canning Town. “I’m really looking forward to fighting again, it’s been longer between fights than I want, so can’t wait. I don’t know my opponent, no disrespect intended but I don’t care who I am fighting, just that I am fighting and winning. I came to this Country with one intention, to be a World Champion, that is my goal, that is why I am here at the TRAD TKO. Training has been going very well, under the tuition of Mo Hussein, he’s an excellent trainer, he trains my brother (Siar) also. We have great training and sparring sessions at the TRAD TKO and it’s going well so far. I’ve been sparring Manny Muhammad, who’s also fighting on the 25th October show, as well as TRAD TKO gym mates Amro Ezzat, Festim Lama and of course Siar. Onder Ozgul vs Matthew Pepper features on the undercard of the Baz Rehman sponsored Marianne Marston versus Marianna Gulyas MBC International title clash, takes heads up the Dave Murphy Acourtier Events promoted CAPITAL PUNISHMENT mega event at York Hall in Bethnal Green, London, on Saturday, 25th October 2014. Tickets, priced £35 (Standard Seated) and £60 (Ringside) are available from Antonio on 07535 806545, any of the boxers taking part, on-line at www.tkoboxoffice.com and www.acourtier.com - or call the ticket line on 07960 850645 or 07809 499896.